Marco Bünte is an Associate Professor of Politics and International Relations at Monash University Malaysia. His research interests include constitutionalism, governance, democratization, human rights and civil-military relations. Dr. Marco Bünte is Associate Professor of Politics and International Relations at the University of Monash Malaysia. He is also Associate Senior Fellow at the German Institute of Global and Area Studies (GIGA) in Hamburg, one of the most renowned Area Studies Centers in Europe. He has taught at the Universities of Helsinki, Münster, Hamburg and Kiel and has been a Visiting Fellow at Science Po in Paris, City University of Hong Kong, the Curtin Institute of Technology in Perth, the Indonesian Institute of Science (Lipi) in Jakarta and Chulalongkorn University in Bangkok. 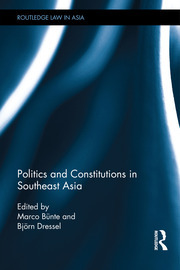 Dr. Marco Bünte is the Co-Editor of the Journal of Current Southeast Asian Affairs and serves on the editorial board of the German Journal of Asian Studies. He holds a PHD in Political Science and a MA Degree in Politics, History and English Literature from the University of Muenster (Germany).